Sarah @ Berry Barn Designs! Congrats Sarah! Here is her beautiful little doll quilt. You can check out her blog HERE for a tutorial and to download a free Forest Friends template to applique on a quilt of your own! Sarah gets a $25 gift certificate from Fat Quarter Shop, a pattern from Swirly Girls Design and a thread sampler from Aurifil. Oh how I wish I could give all you guys a prize! Everyone worked so hard and really pushed to get these quilts finished up. Each and every one is gorgeous…I swear! I’m not just saying that:) I love how creative everyone was and the colors and layouts were all so inspiring. Well done! 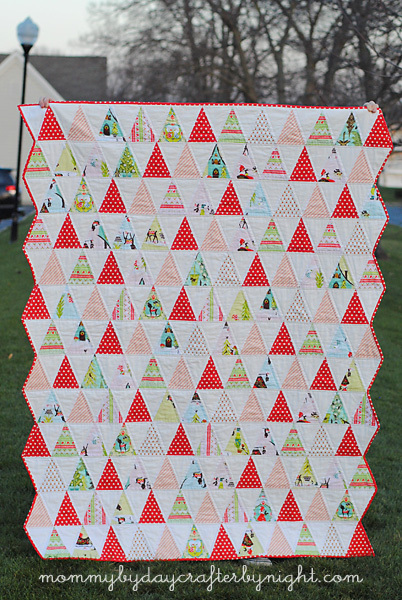 Sunnyside Triangle Quilt by The Sassy Quilter, measures 50 x 64. Were you wondering why you never got to see my finished triangles from the Triangle Quilt Along??? Well, it got a little crazy sorting through all the final entries that I got a little behind! I also got a new camera and am trying to figure out how to get decent pics….so easy on my trusty iphone. This quilt finishes at 50″ x 64″. I just loved working with these fun prints in Sunnyside by Kate Spain for Moda. I used a layer cake to cut mine and then added some solids to fill in the gaps. I quilted along each side of the diagonal seams in a 50wt, 100% cotton Aurifil thread. The color is a light gray that blended perfectly with all these different colors. For the backing I used a print from the same line. I used a Zig Zag stitch for my machine binding technique just to spice things up a bit! I think it is fitting for the triangles. Actually, the stitch I used is a little more than just a zig zag, this is called an Elastic Stitch on your machine. It takes three stitches in each direction….a little prettier I think. Keep the seam line in the center of the stitch and you are bound to catch your binding edge on the back of your quilt! This method can be a little more forgiving if you have a hard time keeping it in the ditch. Here is the backside of the binding. These labels are by ikaprint and can be designed in a ton of different styles! They really make it simple to get my quilts labeled, especially since I tend to forget that step…..I know, bad quilter! These adorable labels can be purchased from ikaprint HERE! ikaprint let me create my own online store with them so the labels are at a discounted price, yay! So click on the link above and have a look around. Now! Who out there missed the date to finish up there Triangle Quilt??? So keep at it guys and gals! It is not too late to be inspired and get those Triangle Masterpieces finished up! You can do it! 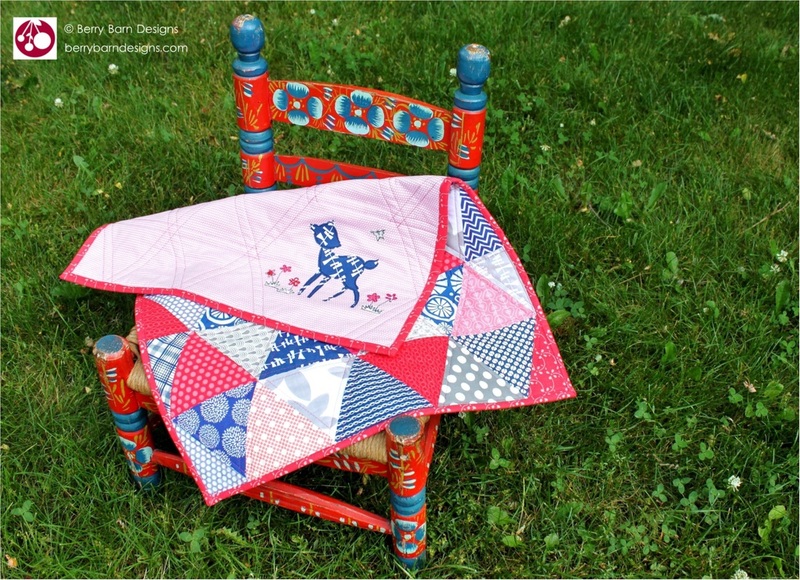 I am so excited to launch my first Quilt Along here at The Sassy Quilter! Lots of you said you really wanted to make a triangle quilt, but just haven’t yet…so, here is your chance:) I’m calling it the Triangle Quilt Along and I have rounded up some awesome sponsors and prizes! It will be a five week process with weekly link ups to share your pics for a chance at prizes, with an awesome Grand Prize at the end with our Triangle Extravaganza! I want to encourage everyone to join in because you are going to be surprised how easy this quilt is and it not too big so you will have no problem keeping up!!! Remember there are no blocks in a triangle quilt so once you cut them out….you just piece your rows and join them…Easy! Here is a coloring sheet you can print to help you visualize your quilt. Not until March 21st! So you have got plenty of time to get your thoughts and fabrics together. Triangles = 1/3 yd cuts of 13 different fabrics. I used 10 prints and 3 solids. You can use as much or as little variety as you like. Just get larger cuts of the same fabric if you want less fabrics in your quilt. For example: You may get 2/3 yds of a particular fabric you want more of and then get only 12 different fabrics. I will warn you that you need exactly 1/3 yd of each, so if you want to be on the safe side you can get 1/2 yd and you will have some extra to add to your scrap bins! As long as your cuts of fabric are generous and give you room to square up the edge, you will be fine. If you want to use Fat Quarters, that would be two of each of the 13 fabrics, 26 in total! Do I need a special ruler? It will be super easy if you use a 60 degree equilateral triangle ruler! It will need to cut a 6″ triangle and that little blunt tip is a life saver. You can find one from Creative Grids HERE, but I will show you how to cut one with your regular rulers too. Please ask if you have any questions about picking your fabrics!!! I can help with calculations if this is confusing to any beginners…or anyone else:) This is a throw size quilt, if you want to go smaller or larger…we can figure out that too! Let’s make this fun and get inspired by each other! I would LOVE your support:) Leave a comment letting me know if you are joining in! The fabrics are Simply Style and Boho Girl. I also threw in some solids to break it up. If you want to know more info on how I cut and pieced this Triangle Quilt, visit my previous posts HERE and HERE. I loved this fun paisley for the backing. I like the back of a quilt to be extra sassy! I quilted it using a 50wt. Aurifil thread in lime from the Simplify collection. I am so in love with these threads!!! I used a navy for the binding. You can get this set at Cotton Bliss HERE! HERE is the tutorial I used to machine bind this quilt. P.S. Have you checked out Gotcha Covered Quilting? 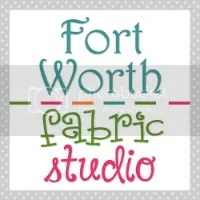 Here is their Etsy shop with lots and lots of great fabrics to start off your new year and new projects! The fabrics are Simply Style by V&Co. just the blue and green shades though. Can’t wait to get this sandwiched and quilted. If you know me, it may take a while to get that done:) I like to save up a few and have a sandwiching party. What to know about these triangles….wayyyy stretchy. I wish I had starched my fabric before I cut it instead of after cutting the triangle. A little over anxious to get started on this one. Better late than never! 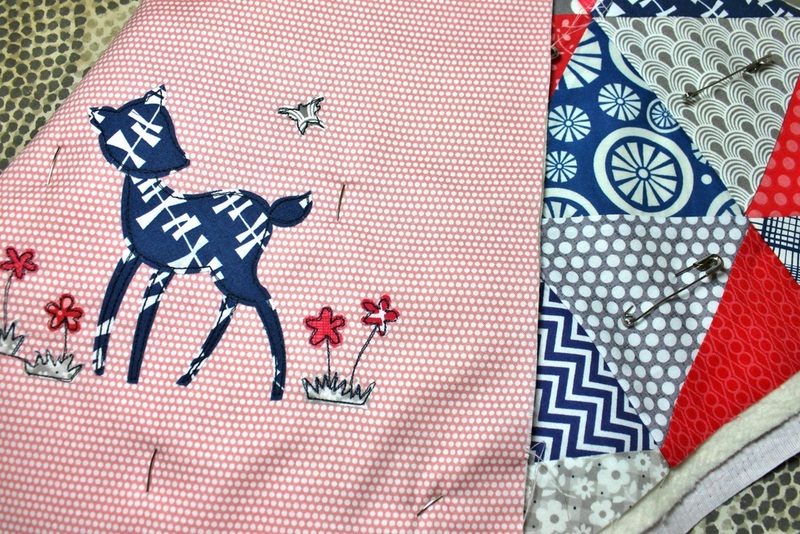 I have already started my next project which was inspired by Kelly@MyQuiltInfatuation. She used a double slice quilt pattern and said it was quick and I was looking for just that. Here are the gorgeous fabrics I ordered from Moona Fabrics on Etsy. Piper by Dear Stella is the fabric line. Love, love , love these and they weren’t easy to find(been out a while). Sue@Moona Fabrics was so quick to answer my questions and help me get the bundle I was looking for… and they arrived lickety-split! You guys should definitely go and check them out here. Lots of yummy fabrics over there and Sue is kind enough to offer us a coupon code for free shipping on domestic orders over $30! Expires 11/1/13 so you better snap it up quick! Moona Fabrics has more of this line(Piper by Dear Stella), Lucky Girl by Jennifer Paganelli, Lottie Da by Heather Bailey, and many others . . .
so visit Sue at her online shop here! Simply Triangles and a Giveaway! In honor of something new, I hope you will check out this new online quilt shop, Cotton Bliss! Cotton Bliss is a new online fabric shop specializing in today’s designer quilting fabrics, notions and patterns. They have some great prices you guys and plan to add lots more as the shop grows! Speaking of… If you don’t see what you want, let Stefanie know and chances are she can get it for you. Top-notch service with discount prices are their specialty! Today’s giveaway is this lovely Simply Style charm pack! ♥Subscribe to the Cotton Bliss newsletter here and leave a comment on this post letting me know that you did so. ♥Like Cotton Bliss on Facebook here and leave a comment on this post letting me know you did so. ♥For a bonus entry>>> post a link on their Facebook wall here to your favorite product on their site here and leave a comment on this post telling me your favorite too. I just ordered up some of this delicious Scrumptious by Bonnie and Camille! For an extra temptation, Stefanie will follow up your newsletter subscription with at 10% off coupon that will be emailed to you to use on your next order!! !